Cambridge Islamic Sciences: O People of England - How Can You Refuse an Opportunity Like This? O People of England - How Can You Refuse an Opportunity Like This? Opportunities like this do not come knocking on our door everyday. What is coming up in Cambridge and Online in every other city is God-sent. Imagine how it would be to have a deep understanding of the surahs contained in the last part of the Qur'an - the surahs that are often recited in our prayers, the surahs that are short in length but very weighty in meaning, carrying the core essential message of the Qur'an. The series of seminars on the 30th Juz' of the Qur'an is a special blessing from our Lord, with the rare opportunity to study these surahs with an extraordinary scholar and thinker who is an expert in both tafsir and hadith. Will you not accept this blessing? 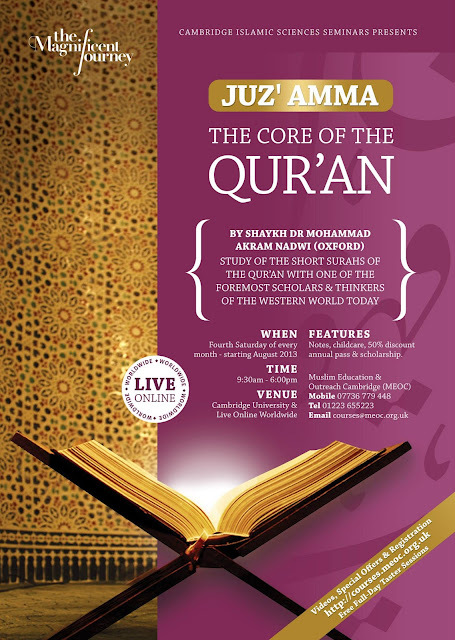 The year-long monthly seminars are starting this Sunday with an Introduction to Juz' Amma and Tafsir of Surah An-Naba'. Study of the short surahs of the Quran with one of the foremost scholars and thinkers of the Western World today. We aim to cover the whole of Juz' Amma in 12 sessions InshaAllah. > Free Taster Session for those who have not attended Shaykh Akram Nadwi Seminar before.